Instagram has grown exponentially in the last few years and is no longer the neglected little cousin of the social media world. Brands who had given Instagram the cold shoulder in the past are now scrambling to grow their audience on the platform which now boasts over 400 million users — far exceeding Twitter. If you are one or a new brand trying to gain traction on Instagram, you need all the help you can get to make sure that you’re reaching your target audience. In this post we’ll be looking at 20 Instagram tips that will help your Instagram grow like gangbusters. Some of these tips are simple to implement and some are useful tools that will optimize your time spent on Instagram. Download The Ultimate Guide to Instagram Marketing to grow your following, increase engagement, and maximize the results of your Instagram marketing. Before we get into the 20 tips, it’s important to remember that the content you’re producing should always be tailored for your target audience. Simply employing a new tool or adding a retro filter will not make a difference if you’re not reaching the right people with the content they want to see. In other words, don’t start posting photos of cats, if you sell bikes just because the photos get likes. Always cover your bases and choose your moves on proven audience research to make sure your efforts aren’t going to waste. Makes sense right? 1. Direct Message your audience and influencers. Users often forget that Instagram allows you to send direct messages to anyone on the platform. This forgotten feature is the easiest way to get in touch with your audience or influencers in your industry. By reaching out and building a relationship with popular Instagrammers in your niche you’ll be able to get in front of a new audience. 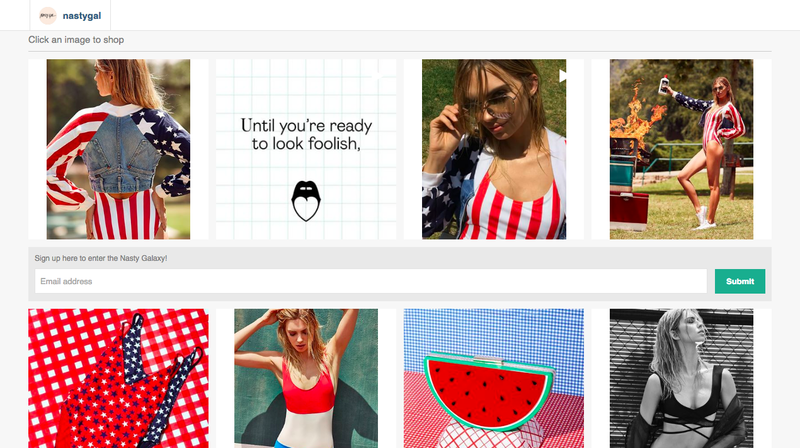 Hootsuite wrote about the perfect example of a use case from the Gap. 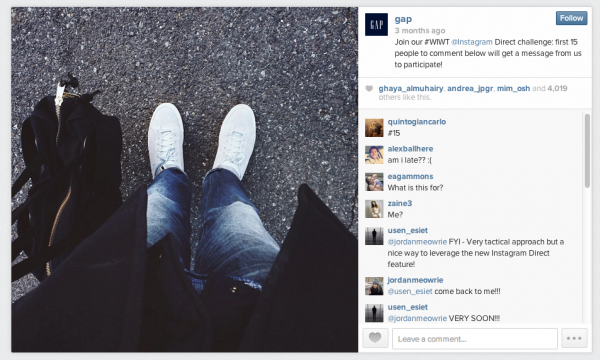 Gap launched a contest using Instagram Direct just two hours after Instagram announced the feature. The brand sent the first 15 people that commented on it’s photo a Direct Instagram that asked for photos of what the users were wearing for a chance to win a prize. 2. Embedding your photos on your website = more followers. This way it will be easy for your website visitors, especially the regulars, to view your Instagram content and follow your brand on Instagram. 3. Maximizing your 30 hashtag limit. Take a look at popular accounts in your niche and use the same hashtags they’re using to maximize your targeted audience. Save bundles of 30 hashtags that vary with the content you posting in your notes for easy copy and paste action. Avoid using generic popular hashtags that are not targeted in any way. Side note: Add the hashtags into a separate comment so that they stay hidden in the feed unless the comments are viewed. Kevan Lee from Buffer wrote an awesome post on "A Scientific Guide to Hashtags on Social Media". Check it out to learn more about hashtags and how to use them to reach more people. 4. Tagging your photos to alert other influential accounts. By tagging your photos with popular accounts they will be alerted directly on their profile in the “Photos of you” section. Use this technique as opposed to tagging them in a comment which they can easily miss. 5. Make use of one minute videos. Instagram now allows one minute videos which means more time for more content. Get creative with the added time by including more of the video content your audience loves to watch. 6. Use Iconosquare or Followers+ to see who isn’t following you. By unfollowing the people that aren’t following you, your Instagram profile will have a better follower ratio — thus making your brand look more legitimate and less spammy. A tool like Iconosquare or Followers+ will let you see who isn’t giving you any love in return. 7. Curate free user content. Struggling to consistently post great content? Use the content that is being generated by your audience. Try having one day where you feature one account. This way your audience will be more inclined to share things about your brand and feel like a part of your success. 9. Leverage different mobile editing tools. If you’re using the built-in Instagram filters on your photos, then you’re what folks call “#basic”. Avoid being basic at all cost by using a different mobile photo editing tool. Tools like, VSCOCAM, Afterlight, and Priime, all have uniquely styled filters that are sure to make your photos stand out from the crowd. Just promise you won’t go crazy with the editing, people tend to dislike that as well. 10. Host an Instagram hashtag contest. One of the best ways to increase your following is with a hashtag contest. Offer an awesome prize and get your audience to post photos under a unique hashtag and theme to win. Make sure they’re following you and then pick a winner. Easy peazy. Using Wishpond’s Instagram hashtag contest tool makes it dead simple to collect entries and pick a winner! 11. Maximize the resolution of your photos. No one enjoys looking at blurry low resolution photos on their beautiful retina iPhone screen. No one is going to follow your content if you’re constantly posting ugly underwhelming stuff. Give your audience the best content possible by maximizing the resolution of your posts. 12. Use a unique hashtag. If you don’t already have a hashtag under your brand, you’re missing out on valuable community content. Having a unique hashtag to identify with your brand distinguishes your brand from competitors and allows Instagram users to easily search for and see content related to your brand. 13. Use Like2Buy or Have2HaveIt to allow your visitors to shop directly off your Instagram feed. Do you use Instagram as a sales tool to show off your products? Tools like Like2Buy and Have2HaveIt create a link in your bio, to a webpage that looks exactly like your Instagram feed so that your audience can buy it instantly. Companies like the New York Times and global retailer NastyGal use it to monetize their Instagram audience. Pretty smart huh? 14. Only use one filter for brand consistency. This is a technique employed by several global brands to maintain branding consistency. Like a logo, brands want their Instagram content to be immediately recognizable when a user scrolls past it on their feed. By using only one filter or colour scheme you’ll be able to easily build solid brand consistency and recognition for your audience. Example: Native Shoes unquestionably has some of the most beautiful and consistent content on Instagram. They don’t use filters but they have a notable theme that makes their content instantly recognizable on Instagram. 15. Follow a competitor’s followers for follow-backs. By following the same users who are following your competitors, they’ll be alerted to your brand’s presence. If you sell outdoor equipment for example, follow and interact with the folks following a company like MEC. If they weren’t aware of you before, they will be now. 16. Schedule your posts in batches. Schedugram and Hoostuite allow you to batch schedule your Instagram posts. Though Instagram won’t allow you to automatically post your images, these tools have you set up everything in advance and post your content with one click of a button — saving you time and money. 17. Schedule a takeover. Do you have relationships with popular influencers in your industry? Allow them to take over your Instagram profile for a day (with set rules of course) and leverage their audience. A popular blogger can post photos of them using your product throughout the day, for example. This will increase your follower base and portray your brand as one that is really in-touch with its audience. The team over at Later.com havea great article to guide you on how to host an Instagram takeover. 18. Create moving photos with Boomerang and Phhhoto. Sometimes a still photo won’t cut it. Spice up your feed by using a “live photo”. Tools like Boomerang and Phhhoto allow you to create moving photos, kind of like high quality gifs. 19. Ask for a feature on feature accounts. It never hurts to ask. Curators on Instagram have large audiences that are hungry for cool products, and getting a feature on one of them can blow up your follower count. Something like sending a product sample in exchange for a feature can do wonders for a brand. But simply try asking first, remember that awesome curators need awesome products to feature. 20. Don’t forget to include a location. Most brands forget to capitalize on the location feature when posting content on Instagram. This allows your followers to click on the location to see more about that location. By adding the location of your business your followers will be able to see your location and the community that’s been adding to it.